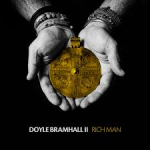 Share the post "Album review: DOYLE BRAMHALL II – Rich Man"
Doyle Bramhall II has worked with many bands and artists including Eric Clapton, Sheryl Crow, Roger Waters and the Tedsechi Trucks Band. ‘Rich Man’ is only his third solo album and the first since 2001 and the death of his father in 2011 (who drummed for the likes of Stevie Ray Vaughan). Norah Jones guests on ‘New Faith’, one of the album’s stand out songs. Another being ‘Harmony’ with its laidback southern rock feel and swirling Hammond playing of Glenn Patshca. You can really get into this song and drift away into the music. ‘My People’ starts with an sarangi to create an eastern feel to the song, that cleverly mixes gospel with traditional Hindu, Islamic and Indian/Sri Lankan greetings. Needless to say there is a jaw dropping guitar solo playing the song out. Wonderful to listen to and a song of unity in these troubled times. ‘Saharan Crossing’ has a distinctive Indian sound, which lends itself well to the epic ‘The Samanas’. This song starts of with a slow blues refrain, before Doyle Bramhall lets rip with bigger guitar riffs midway through. The whole song maintains a trippy, late 60′s rock feel and allows Doyle to show his guitar skills, not that there is any doubt what a top guitar player he is. The Jimi Hendrix cover ‘Here My Train A Comin’ closes the album off perfectly as Doyle pays tribute to one of his musical inspirations. This entry was posted in ALBUM REVIEWS, ALBUM REVIEWS (Mobile), All Posts and tagged album, blues, Concord Music, Doyle Bramhall II, Eric Clapton, Norah Jones, r n b, review, Rich Man, soul. Bookmark the permalink.